On the distant Outer Rim planet of Tatooine, the grip of the Galactic Empire is loose. Instead of bowing to an Imperial governor, the desert wasteland is firmly in control of dreaded gangsters, the most fearsome of which is the vile Jabba the Hutt. Now, you and your allies find yourself in this crime lord’s clutches. Do you have what it takes to survive in Jabba’s Realm? 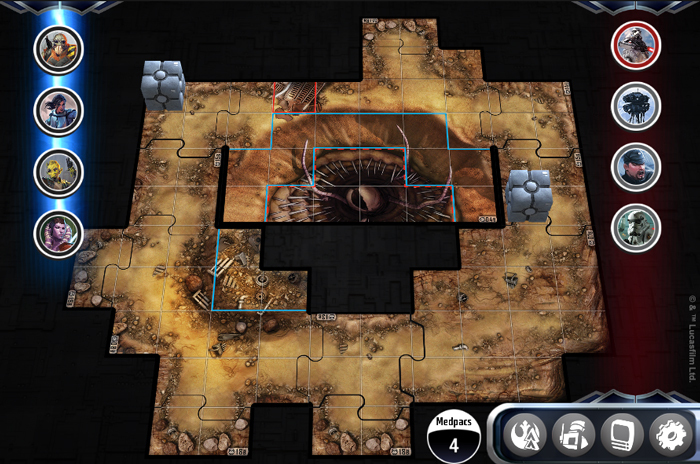 The Jabba’s Realm digital campaign for Legends of the Alliance, a free companion app for Imperial Assault, is available now! The Jabba’s Realm digital campaign is a retelling of the physical Jabba's Realm campaign for Imperial Assault, and it allows you to explore the vile gangster’s domain like never before. 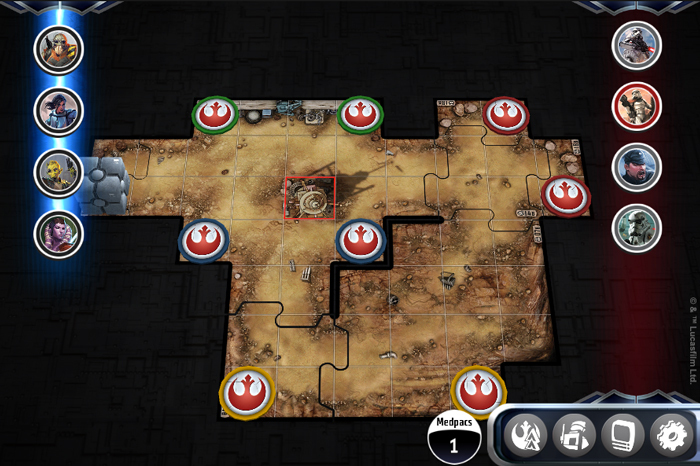 If you're unfamiliar, the Legends of the Alliance companion app is a free app that lets you play Imperial Assault without the need for an Imperial player, letting you team up with three friends in campaigns unique to the digital app. Jabba’s Realm is the second free campaign, and you can download the Legends of the Alliance app from the App Store, Steam, Amazon, or Google Play today. Important note: While the Jabba’s Realm digital campaign is a free addition to Legends of the Alliance, an Imperial Assault Core Set and a physical copy of Jabba’s Realm are required to embark on the campaign. In order to protect the ones they love, your heroes will have to serve the vile gangster Jabba the Hutt over five distinct missions presented by the app. It will take careful cooperation, daring antics, and maybe a little bit of luck to survive in Jabba’s realm. While the overall narrative structure of the campaign is similar to the physical copy of the game, each of these missions is brand-new! But just because the missions are new, that doesn’t mean you won’t be tangling with familiar faces. Your group of Rebels may find themselves going toe-to-toe with the dreaded Rancor, the dewback-riding Captain Terro, and perhaps even Jabba himself. And while you may be outnumbered and trapped, you'll still have allies. The Jedi Knight Luke Skywalker also finds himself on Tatooine, and if you’re lucky, the famed hero may aid you in your adventures. 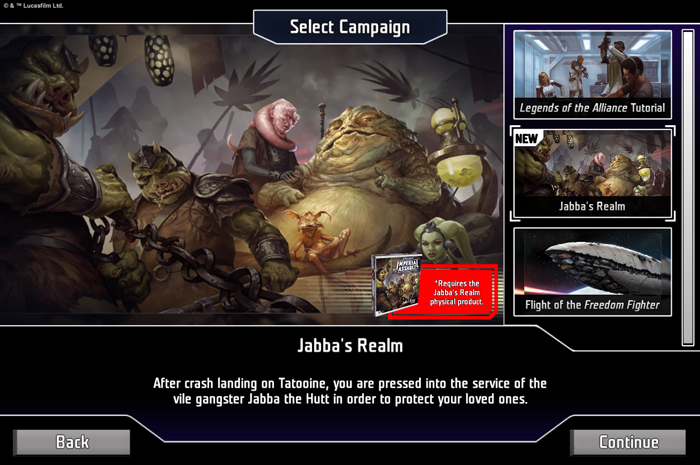 The Jabba’s Realm digital campaign also features a new angle, unique to the Legends of the Alliance app, through encounters. Examining the quieter moments between missions, encounters are text-based narratives that fill in gaps. Your characters may need to perform attribute tests or make decisions that affect the narrative. And furthermore, while the Jabba’s Realm digital campaign is five missions long, there are actually eight possible missions to take part in, offering a dramatic amount of replayability to the campaign. Trapped on an Outer Rim planet and forced to serve the vile gangster Jabba the Hutt, there is little hope for your band of Rebels. But with careful planning, expert tactics, and a little bit of luck, you may just become a legend of the Alliance in Jabba’s Realm! Prepare for a crash landing. The Jabba’s Realm digital campaign is available for download now for the Legends of the Alliance app!